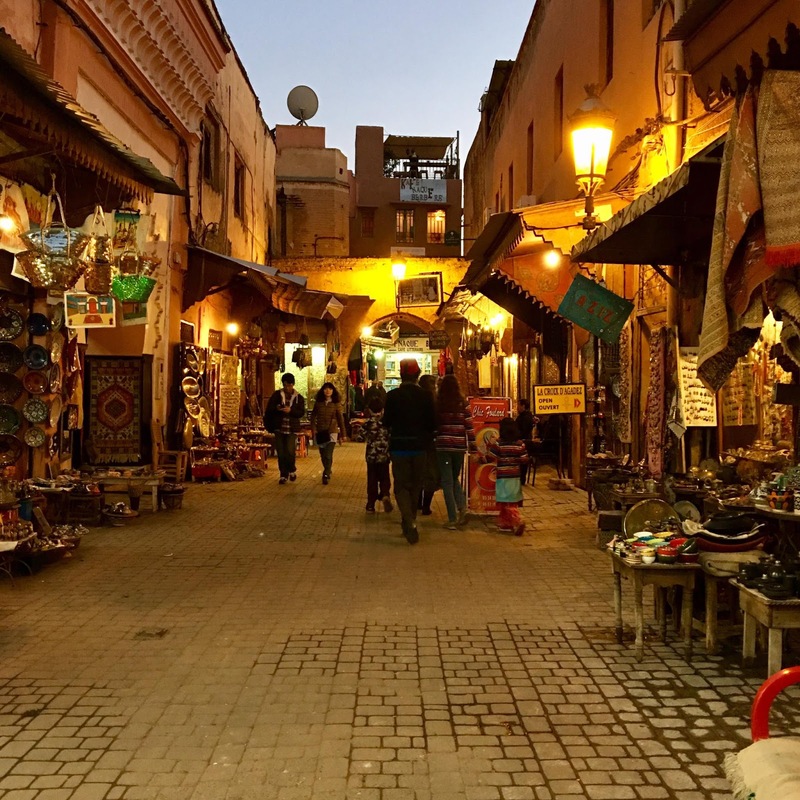 The narrow, winding streets and alleyways of the walled medina of Marrakech provide an endless array of wonders and curiosities. Compared to many, this street is broad and straight and not at all crowded! There are many little alleys and paths that branch off and then twist and curve around. It's easy to get lost and disoriented, especially as there are often high walls on either side. It's fun to ramble around, not quite sure what you might stumble upon. We enjoyed several outings, looking at the interesting things available in the shops. We didn't buy much, as I'd heard that outside of Marrakech we would find better prices, but it was fun to look around. Some of what we payed for was an education, and we learned quickly that it's always best to be clear about what you want and what the cost is up front. There was a little street where several vendors sold chunks of roast lamb. After tasting a sample, we were ushered up a couple flights of stairs and seated at a table. We assumed the man would return momentarily to ask us what we wanted, but instead he came bearing an enormous slab of steaming meat, a basket with several small, round loaves of bread, and a little dish of salt mixed with ground cumin to sprinkle on the lamb. Did I mention it was a large amount of meat? And that my children, with the exception of Peregrine, will not eat lamb? And that utensils were not part of the equation? The kids happily munched on bread while Erik and I dug into the hot, greasy meat with our fingers. We hardly made a dent in it, and kept wishing we would/could have communicated before he brought us enough meat for ten people! It was a costly lunch, around $35, probably more than we've spent on any other meal for the whole family here in Morocco. Ah, well... we learned something. Olives? Yeah, they sell those here. All kinds of olives, olive oil, and other things preserved in jars. Also, lemons preserved in salt are a major ingredient in Moroccan cooking, and you will see tubs and jars of those for sale as well. Slippers, slippers, everywhere, in every conceivable color. Some even have curled toes! There were several places selling tiny baby turtles, and of course the kids were thrilled. The vendor at this one was trying hard to convince me to buy a turtle, telling me how he would provide a small box and food and that it would be "no problem" for me to take the turtle home the airplane. I told him it would be a problem when I tried to take the turtle back into my country. Without skipping a beat, he told me it would be "no problem" because this turtle was Jewish, not Muslim. This, of course, is referring to President Trump's recent ban on immigration from several Muslim nations. Trump has come up in conversation with several different Moroccans we've spoken to, and it's been quite interesting to hear their perspectives. In general, I'd say they are much more able to see the bigger picture and not be reactionary. One man told us he thinks Trump is "strong, not crazy", but later said, "maybe a little crazy." What seems entirely lacking in their attitude is being offended. I was honestly a little concerned about coming to a Muslim country right now in light of everything that has happened recently, but the people have been nothing but friendly and hospitable, and are happy to talk with us without assuming our president represents our way of thinking. In one little courtyard in the dyers market we spotted a few felted goods, including some slippers. Erik and I both have wonderful, felted slippers at home and have never found any others that keep our feet as warm. We'd considered bringing them, having heard that Moroccan homes rarely have heating, but decided not to due to space constraints. 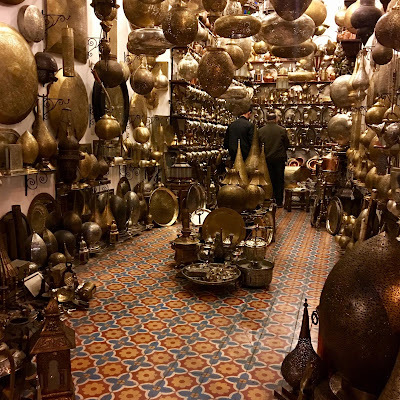 After one night in our riad, we regretted not bringing them! We'd seen these slippers the first day and not bought them, so the second day we went out looking for them. We found the first place we'd seen them, and then found one other place nearby that had some we liked better. Still, we thought we'd look around a little more, so we continued on. We walked further into the souk and ended up in a little shop called Mr. Boho, full of handmade shoes and slippers. When we asked the shopkeeper if he had any felted ones, he said he could get some and ran off. We jokingly said to each other that it would sure be funny if he came back with the ones we'd just tried on at another shop. Sure enough, Mr. Boho returned a few minutes later with the very same pairs we'd tried on, and just happened to have a handful of felt necklaces I'd admired at the other place as well! These guys all seem to know one another and work together. We enjoyed a long conversation with Mr. Boho and left with two pairs of felted slippers and one necklace. Our feet have been happily warm ever since. The metal lamps! Let's just say it's a good thing I'm limited in the amount of space I have to bring things back. Baby chameleons? But of course! And do my children want to buy one? But of course! This beautiful, colorful square we came upon one afternoon was the first place we'd seen women selling their wares. It is called Rabha Kadina and was once the site of the slave market, and later a grain market. Now it is lined with little apothecary shops selling spices, herbs, remedies, cosmetic items, oils, and potions. Apparently this is where the local healers and magicians come to stock up on ingredients, and I read that the little animals like turtle and chameleons sold in the apothecaries may be used as ingredients in traditional medicine, or used as sacrifices. I guess that would explain why they're sold in the apothecary shops. Erik bought some menthol crystals to help clear up stuffy noses. Powerful stuff. The textiles get me every time. Again, it's a good thing I have some constraints! Black and white, or color? Both, please. Snails, a local delicacy, seem quite the popular snack. No one in my family has wanted to try them yet. All manner of interesting things could be found in the apothecary's shop- chunks of indigo, powdered dyes of various colors, licorice sticks, cinnamon bark, frankincense, rosebuds, argan oil, little clay pots of poppy powder that, when moistened, stain the lips red, chunks of kohl to line the eyes, terra cotta scrubbers to smooth the feet, "Moroccan toothpicks", and more. So many fantastic photos...you're so brave to just go with your family of 6. I would want to bring home one of those lovely lamps, too.